Are Deutsche Bank Asia Ties the Straw Breaking the Bank’s Back? With its home market in Europe languishing, troubled European bank Deutsche Bank bet big on the fast growing Asia–Pacific region, a bet that has now turned sour. “We feel very good about the Asia Pacific and especially as we see some markets coming back into growth,” Gunit Chadha, co-chief executive officer of Deutsche Bank AG for Asia Pacific, told Bloomberg in 2014, saying Deutsche was “deeply invested” in 16 countries. It wasn’t just plain vanilla in Asian investment banking; Deutsche Bank specialized in complex and risky derivative products on fixed-income securities and currencies. At the end of 2014, the bank had almost $60 trillion in notional derivative exposure on its books globally. The exposure issue has been downplayed but make no mistake, banks are heavily exposed to Asia and the Middle East. 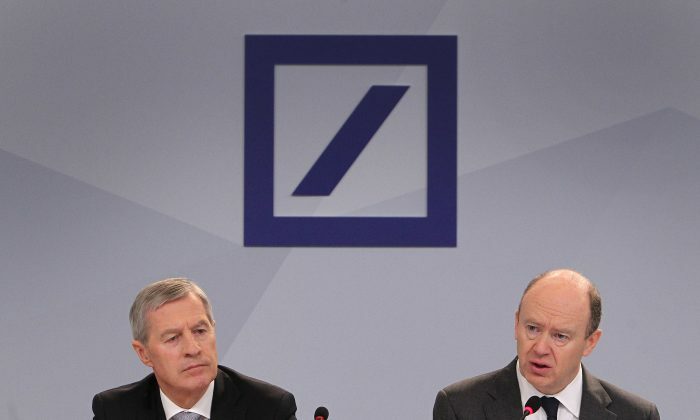 “Deutsche Bank is a perfect example. They are knee deep in all that stuff … and now they are in a precarious state,” said Jeff Snider, chief investment officer of Alhambra Investment Partners. The company employs about 16,000 people, or 16 percent of its workforce in the region, most of them working in investment banking and trading functions. Deutsche Bank had the top position for dealing in foreign exchange markets in Asia in 2014 and was third for fixed-income trading, according to Reuters. Derivatives on currencies were until recently a one-way bet, like the Chinese renminbi. That was until a surprise devaluation last August signaled a change in the official exchange rate regime, wreaking havoc in the onshore and offshore renminbi derivative markets. 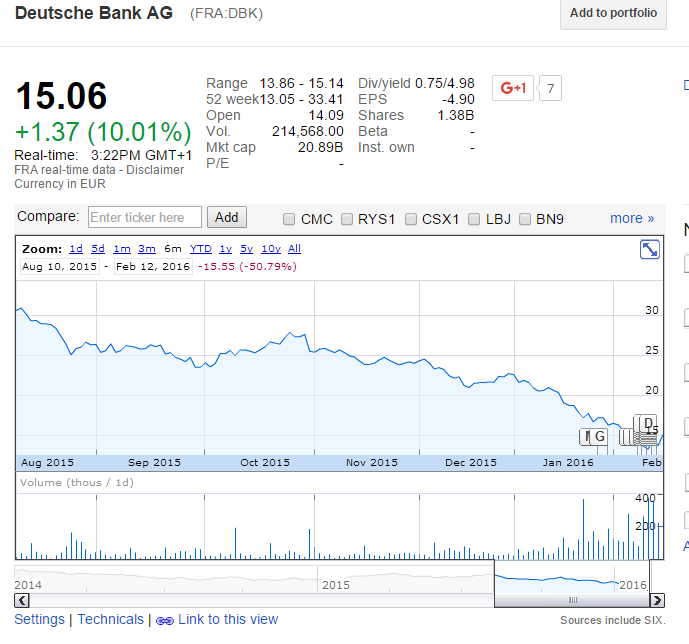 It is probably not a coincidence that Deutsche Bank shares started their precipitous 51 percent drop to 15.06 euros just before the devaluation happened. On top of the added volatility in the currency markets, massive capital outflows from China and the unwinding of the carry trade also leave Deutsche Bank exposed. Speculators backed by the bank may not be able to make good on their part of the derivative contracts, in which case Deutsche has to foot the bill. Other potential losses may include loans to commodity companies and traders such as Glencore PLC or Anglo American PLC. “People who have been around 10 years say this is the worst it’s ever been,” said one banker stationed in Asia, who declined to be named. Even Deutsche Bank’s own credit analyst, Dominic Konstam, is concerned about European banks’ exposure to China in particular and Asia in general. To make matters worse, Chinese regulators launched a corruption probe against the president of Deutsche Bank’s China joint venture partner Hua Xia, subsequently put up for sale in December. As a result, Deutsche executives have been leaving the sinking ship in droves. Shortly after the devaluation of the yuan, Bhupinder Singh, the former regional co-head of corporate banking and securities, decided to leave the bank last August. Douglas Morton, head of the investment banking unit; and Venky Vishwanathan, head of capital markets, also left last year.